Former Kuomintang (KMT) chief Mr Lien Chan’s recent decision to attend the military parade marking the 70thanniversary of Japan’s withdrawal from the Second World War, to take place in Beijing on 3 September 2015, has caused significant criticism from pro-independence activists in Taiwan. Gathering at the Taoyuan International Airport, the protesters were shouting slogans such as ‘’Lien betrays Taiwan’’ and ‘’Never return to Taiwan’’. Taiwanese pro-independence activists launched a protest at an airport yesterday as former Kuomintang chairman Lien Chan left to attend Beijing’s military parade to mark the 70th anniversary of Japan’s surrender in the Second World War. 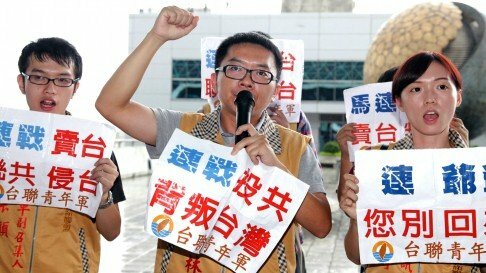 Members of the Taiwan Solidarity Union and the 908 Taiwan Republic Campaign gathered at the departure hall [news link in Chinese] of Taiwan Taoyuan International Airport, chanting slogans including “Lien betrays Taiwan” and “never return to Taiwan”. The mainland’s official news agency Xinhua made a reconciliatory move on Monday morning by putting a renewed emphasis on the participation of Kuomintang veterans in the grand parade. “It marks the first occasion for Communist and Kuomintang veterans to parade together,” the state media said, adding that they will be the first to march through Tiananmen. The veterans, who are all about 90, would make up two of the 50 formations and would ride in convertibles during the parade, the event’s spokesman Qu Rui said last month. Lien’s announcement that he would attend Thursday’s massive military parade in Beijing unleashed a tide of criticism in Taiwan, including from the KMT and the Mainland Affairs Council. “[Taiwan and the mainland] should also exchange our perspectives on history for reconciliation,” Lien’s spokesman Chang Jung-kung told reporters at the airport, according to the United Daily News. Both sides have long criticised each other of putting up a “passive fight” during the war and claimed their own troops led the resistance against the Japanese. Meanwhile, the Communist Party’s official newspaper People’s Daily on Monday published a signed commentary to defend Beijing’s amnesty of thousands of prisoners as part of its commemorations to mark the end of the war. They include a number of elderly war veterans who fought the Japanese or for the Communist during the civil war, or in later conflicts including the Korean war or China’s invasion of Vietnam in the late 1970s. The amnesty is neither the “personal will [determination] of an authoritarian leader” nor the “result of political bargaining”, but rather, a decision passed by the legislation “in accordance with law”, said the commentary, penned by a researcher from the Chinese Academy of Social Sciences. The amnesty was approved by the National People’s Congress in late August.